I guess you know the download area has a template. I cut mine out of a kitchen cutting board. Yes. The template is in the downloads section. If you print to scale, you can use it as a template. The thickness will be 1/2-3/4". You want the end of the fan cage to be as close to the hole in the firewall as possible (without touching). To big of a gap will reduce airflow. An old thread, but hopefully someone is listening. My '68 has a connector with a single black wire with one pin (ground) and a second connector with two pins (to two separate wires). I presume the second green wire is for high speed. Do I tie these two green wires together and connect them to the single power wire for the '87 blower? I think what you described is right. However you will have only off/high speed. I suppose the C4 controlled fan speed with resistors? as for the color codes of the '68, MY RECOLLECTION is there was just one wire going to the blower motor.....on my '72, so maybe some wiring changes..?? There is a Blower Motor Resistor in the air box for cars built before 69. I suppose that is what controls the lower speed. So, if you hooked both wires to the same terminal on the C4 motor you would get 2 speeds, right? Correct, there is a resistor in 1968. Unfortunately, I have no idea what purpose it serves. Maybe someone else can support your thinking. Two speeds would definitely be better than one. Another option would be to put the fan portion on my original motor. It continues to run very well. I've read elsewhere that the way it fastens may be different so that may cause other complications. Vent Pipe - On the Opposite Side - Route Something? Still working on this. The new blower has then opening for the vent pipe on the OPPOSITE side of the original blower motor. 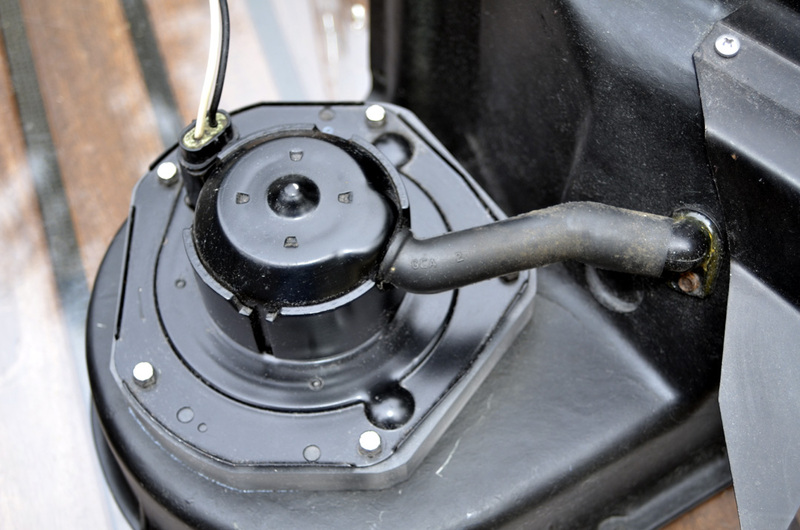 The picture below shows the original pipe on the original motor and a pencil protruding from the opening in the new motor. Did you route a custom pipe to this opening? I think I reused the C3 hose and plastic elbow. It could be the C4 hose, not sure. I think its late 70's parts. Great photo. Thanks! Your new vent hole is where mine is on the new blower. I just realized that the old and new blower housings have very different shapes. I think I can rotate the new one about 180 degrees and get close to the old hole position. Hopefully there are no obstructions at the evaporator housing.